Panasonic is betting hard on 3D, pushing out not only a new 3D camcorder, but also a full line of 3D Viera HDTVs. The VT 25 Series comes in 50, 54, 58 and 65-inch sizes, with THX certification, 24p cinematic playback and a 5,000,000:1 contrast ratio. It is also equipped with VieraCast digital content, wireless LAN adaptor, SD Reader, two USB ports, four HDMI ports and a pair of 3D glasses for good measure. Panasonic's initial Full HD 3D televisions will ship in the Spring of 2010 with five models in the VT25 series. Panasonic's Full HD 3D televisions provide full 1080p resolution to both the right and left eye, thereby giving the viewer the ultimate 3D entertainment experience. The VT25 series includes four screen sizes ranging from 50-inches to 65-inches - the TC-P65VT25 class (64.8" measured diagonally), the TC-P58VT25 class (58" measured diagonally), the TC-P54VT25 class (54" measured diagonally) and the TC-P50VT25 class (49.9" measured diagonally). One pair of 3D Eyewear is included. In addition to providing 3D viewing, the VT25 series of VIERA HDTVs features the enhanced VIERA CAST service with Wireless LAN Adaptor ready on its USB port, video call capability(2), VIERA Image Viewer to view JPEG digital still images and HD video recorded on an SD Memory Card; VIERA Link, a PC input, two USB Ports, THX certification and THX Movie Mode, 24p cinematic playback, 600Hz Sub-field Drive (produces 1080 TV lines of moving picture resolution), Infinite Black Pro display with 5,000,000:1 native contrast, four HDMI connections a RS232C connection and ISFccc capability. 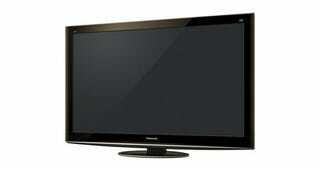 In addition these TVs feature new phosphor science that allows the TV to switch quicker, providing a smooth 3D image. As with all the Panasonic Plasma HDTVs, the Full HD 3D models have a panel life of up to 100,000 hours and are mercury and lead free.